From The Post-Standard, Syracuse, August 6, 1952. 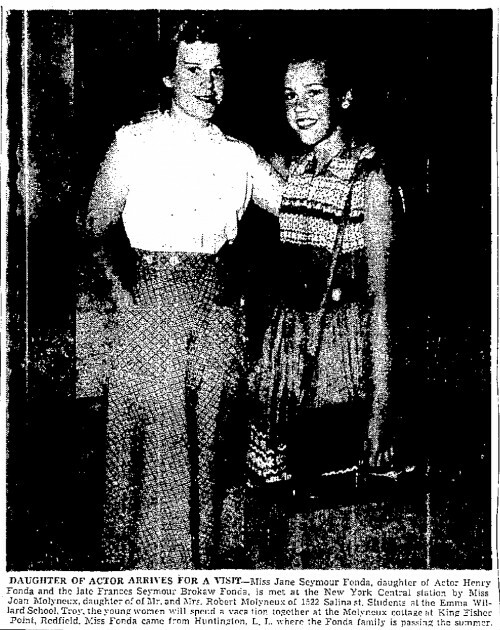 Miss Jane Seymore Fonda, daughter of Actor Henry Fonda and the late Frances Seymour Browkaw Fonda, is met at the New York Central station by Miss Joan Molyneux, daughter of Mr. and Mrs. Robert Molyneux of 1522 Salina st. Students at the Emma Willard School, Troy, the young women will spend vacation together at the Molyneux cottage at King Fisher Point, Redfield. Miss Fonda came from Huntington, L.I., where the Fonda family is passing the summer.